Patti Husic, Centric Bank President & CEO and Leslie Meck, SVP for Centric Bank and Advisory Board member, presented a $50,000 donation to The Salvation Army Harrisburg Capital City Region in support of their capital campaign titled Transforming Lives, Building Legacies. Joining Husic and Meck were a few excited preschoolers who attend the Summer Youth Enrichment Program currently held at Beulah Baptist Church in Steelton, Pennsylvania. Patti Husic, Centric Bank President & CEO and Leslie Meck, SVP for Centric Bank and Advisory Board member, presented a $50,000 donation to The Salvation Army Harrisburg Capital City Region. It’s a privilege to help strengthen our communities by supporting The Salvation Army's capital campaign. For 132 years, they have been providing health and wellness programs, educational opportunities, and services to families in our backyard. Patricia A. (Patti) Husic, Centric Bank President & CEO, and Leslie Meck, SVP Chief Retail Officer, presented a $50,000 donation on June 26 to The Salvation Army Harrisburg Capital City Region in support of their capital campaign titled Transforming Lives, Building Legacies. Headquartered in Harrisburg, Pennsylvania, Centric Bank ranks in the Top 100 U.S. banks for SBA 7(a) lending and is well-known for their mission to #BeTheDifferenceMaker in small business banking. Celebrating their ten-year milestone and cresting $500 million in assets, Centric Bank continues to invest in organizations that inspire and make a positive impact in their service area. “Centric Bank’s generous gift to The Salvation Army’s capital campaign is the first gift to be applied to a new $500,000 challenge grant from The Donald B. and Dorothy L. Stabler Foundation. Patti Husic and her team are setting the pace for the Stabler Foundation challenge,” says Kathy Anderson-Martin, Director of Resource and Development. “It’s a privilege to help strengthen our communities by supporting The Salvation Army. For 132 years, they have been providing health and wellness programs, educational opportunities, and family services to those in need. With a new gymnasium, educational wing, commercial kitchen, outdoor athletic fields, and family services suite, the 38,000 SF Service and Worship Center will be transformative for children and families in our backyard,” says Husic. 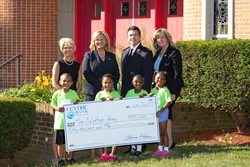 Centric Bank supports The Salvation Army’s programs through service and resources. Meck is a member of the Advisory Board and sees firsthand how the morning breakfast program, the Choice Pantry, the Red Kettle campaigns, and the WIN Women Involved auxiliary assists those in need. In 2016, The Salvation Army Harrisburg served 18,320 people in need providing 111,643 points of services and assistance, including 81,931 food assists, 4,384 educational sessions, and reached 2,985 children and teens who participated in structured youth programs. The new Service & Worship Center is located on 29th Street and Rudy Road in Harrisburg. Site work and demolition of vacant, dilapidated structures is in progress and construction is scheduled to begin at the conclusion of the capital campaign. To date, $7 million in resources has been committed to the project by the local community. Photo Caption: Patti Husic, Centric Bank President & CEO, second from left, and Leslie Meck, far right, SVP for Centric Bank and Advisory Board member, presented a $50,000 donation to The Salvation Army Harrisburg Capital City Region in support of their capital campaign titled Transforming Lives, Building Legacies. Major John Griner, Corps Officer, second from right, and Anne Deeter Gallaher, Vice Chair of the Advisory Board and a member of the Capital Campaign Committee, accepted this generous donation. Joining Husic and Meck were a few excited preschoolers who attend the Summer Youth Enrichment Program currently held at Beulah Baptist Church in Steelton. A three-time Best Places to Work and named a Top 50 Fastest-Growing Companies for five years, Centric Bank is headquartered in south central Pennsylvania with assets of $540 million and remains the leader in organic loan growth in central Pennsylvania. A locally owned, locally loaned community bank, Centric Bank provides highly competitive and pro-growth financial services to businesses, professionals, individuals, families, and the health care and agricultural industries. With a Five-Star Bauer Financial Rating, Centric Bank, named a Top 100 SBA 7(a) Lender in the United States in 2016, Centric also ranked #1 in approved SBA 7(a) loans in the Commonwealth of Pennsylvania. The bank is a Top 20 Lender for SBA 7(a) Loans in the Philadelphia Region.